Considering how many people post videos on Youtube, I’m surprised I never thought of posting about this before. While Myspace has been customized to such an extent so as to make the average Myspace profile virtually unrecognizable from its earlier format, not many people have gone ahead and done the same to their Youtube profile. Firstly, go to your profile page. Now, if you want to make any changes to it, click the ‘Edit Channel’ button. It’s located on the top left-hand side of your profile. This takes you to the various settings for your profile. 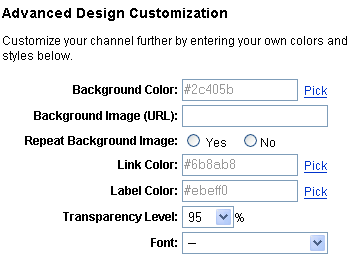 Channel Info allows you to set a custom name for your channel. You can pick a name you like or use something based on the videos you upload. You can also add a short description of what your channel is all about. Channel Design is where you can really have some fun. The top part of the page is dedicated to giving you some basic color options for your profile. You can also tweak the layout of the various sections on your profile. If you scroll down the page, you will come to a section that says ‘Advance Design Customization’. Here, you can enter values for the exact colors you want. Alternatively, you can provide a picture of your own to use as the background. The picture has to be hosted on an image-sharing site such as Flickr, Photobucket, etc. Youtube may not have the same range of personalization options that Myspace has but it’s still worth experimenting with. Tell me how you’ve customized your Youtube profile or if you know of any other customization tricks. Update: It seems that channel customizations have been removed from YouTube, the page where they have previously been available are no longer available.